702 Hillview, West Chicago. Photo from Realtor site. Sears Hamilton from the 1923 Modern Homes catalog. Sometimes you come across a Sears house that is cute in every way. This is the case with a Sears Hamilton in West Chicago. The Hamilton is a small cottage with jerkinhead (clipped) dormers, sold from 1922-1930. The county reports that this Hamilton in West Chicago was built in 1927, which is reasonable. "Sunlight comes in the window during the day and in the evening the firelight flickers on the hearth. There is an air of fellowship that makes this a real home," according to Sears. Photo from Realtor site. "Six French windows flood this room with sunlight and air." Photo from Realtor site. 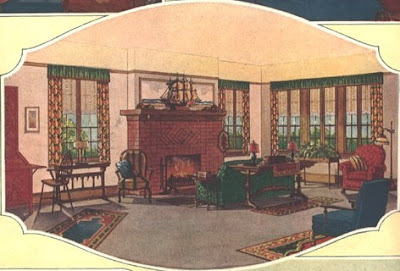 The living room of the Sears Hamilton, from the 1925 Modern Homes catalog. The fireplace design and mantel are the same as in the catalog. "This dining room breathes an air of hospitality, so dear to the heart of every home lover." Photo from Realtor site. The window seat is hinged, providing storage. The owners have knocked out the wall between the dining room and the kitchen. Photo from Realtor site. The small room on the right that now houses an oven was once a teeny breakfast alcove. Photo from Realtor site. "The bedroom is comfortable, airy, and flooded with sunshine." Photo from Realtor site. This is a hallway in the attic with original doors. This was an expensive add-on to the original house. Photo from Realtor site. At the time of this writing, the Hamilton was just listed for sale. This one will go fast! This one has come through time with a lot of its features intact! The attic hall with its well-maintained woodwork is beautiful. I hope the new owners will similarly value the integrity of this house and refrain from extensive alterations!